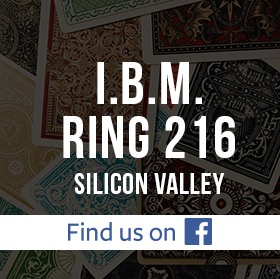 There are still tickets available for the upcoming IBM Ring 216 Awards Banquet and Show starring Eric Buss and Big Al Catraz on Jan 17, 2015. Please contact Treasurer Will Chandler for purchasing tickets (treasurer@ring216.org). The event is for Club members, sister clubs, families and friends! 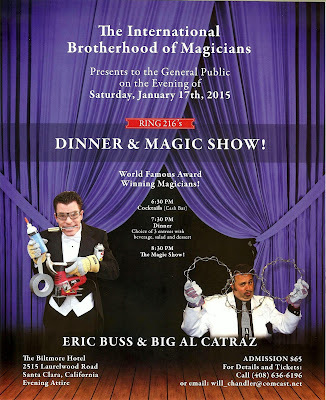 Eric Buss has entertained and amazed audiences worldwide. His innovative and high-energy brand of comedy and magic has earned him some of the industry’s top awards, and a reputation as one of the funniest and most original magicians working today. Eric Buss is not a comedian telling jokes about airline food. He is not a magician wearing a bright yellow leotard. Eric is an imaginative, exciting performer with a knack for “fun.” Throughout his show, Eric Buss invites the audience into his world where hysterical antics are brought to life. Welcome to the San Jose, CA chapter of the International Brotherhood of Magicians, the world’s largest association of amateur and professional magicians. To learn about attending our meetings or becoming a member, just click here. Stay informed about upcoming meetings. Sign up today.